BC Racing Wheels TM 14's are now available for Audi vehicles at ModBargains with GREAT PRICES, FAST SHIPPING, and QUICK DELIVERY TIMES! Give us a call to order at 714-582-3330. Are you looking for a wheel that is strong and durable? So strong that all of their sponsored circuit and drift drivers use the exact same wheel on the race grounds? BC Racing Wheels is definitely your best choice. 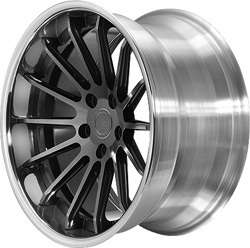 They have such a great reputation because each wheel is completely forged with a CNC out of strong aluminum which allows for streamlined and aggressive designs. With the BC Racing Wheel TM 14, you get the best of both worlds. The TM 14's are a perfect set of wheels with both a deep concavity and classic big lip design. It gives you that new dimension and a nice full face. TM 14 BC Racing Wheels were made for the extreme car fanatic looking for the most durable and beneficial wheel for their ride. The TM 14 is a two-piece fully forged wheel. The two piece construction allows for a huge variety of colors, offsets and sizes so you get to choose the perfect wheel that will fit your personality. BC Racing Wheels prides itself in high end wheels that provide the most surprising quality and stance for the price. When it comes to fitment, durability and aesthetics, the BC Racing Wheels TM 14 is the perfect choice for anyone with a daily driver all the way up to a full time race car! Buying your BC Racing Wheels from ModBargains is an excellent decision. Our product experts will ensure that you order the right fitment and wheel for your car and answer any questions that you may have with ease. We also offer the best customer service in the business, and our delivery times for wheels are quick and easy for your convenience and happiness. We offer great prices on BC Racing Wheels. If you're looking to completely deck out your ride with a new look that's light and strong, grab a set of BC Racing Wheels TM 14's at ModBargains!